Survey of GL1 and XM1 owners: experience so far. Notes and comments from other GL1 owners. My immediate observation is that the GL1 has a better microphone, a better lens, and lower-resolution CCDs as compared with the TRV900. None of my still shots (see above) has the resolution which the TRV900 is consistently capable of, and as demonstrated on my TRV900 page as well as many others. The GL1 video looks good on the TV set, with colors that may tend to be more saturated than the TRV900. But the resolution is lower and the still quality suffers by comparison when viewed on a computer monitor. The controls on the GL1 are in almost every case an improvement over what is available on the TRV900. In particular I was pleased to see a "spotlight" mode which permits reasonable use of autoexposure when filming a stage production under spotlights, a difficult job to expose correctly using the TRV900. The GL1 goes to a maximum of +12 dB gain which is visibly grainy, but less so than the TRV900 at +18dB gain. Even the IR remote is more useful, for instance allowing the menu mode to be entered and menu selections to be made remotely. Does the built-in mic pick up motor noise? Yes, I can hear a faint motor noise in a quiet room, recorded, audible during playback. It's present but faint, not very objectionable to my mind. Outdoors there's so far been enough ambient noise so I don't notice it. Having recorded a tape in a nearby park, I sat down at home with headphones and listened for half an hour to playback of cars going by, people walking, and bird noises. I'm impressed; the stereo imaging and frequency response is really very good. I found the 20x zoom lens on the GL1 useful for getting close-ups of wildlife as you can observe from the stills above. I had a little trouble preventing the zoom from changing speeds while doing a slow zoom with the main zoom rocker but I'm not used to it yet. The zoom control on the handle is a fixed speed (which speed, is selectable in a menu) so that isn't an issue. The autofocus works, but it seems slower than the TRV900, and more fidgety once it arrives; sometimes hunting around the correct position. I have only recorded a few tapes so far on GL1. I have not seen dropouts or blocky playback going forward, but I do often see blocky artifacts during reverse 1x speed play. The GL1 has a 1/5 speed frame-by-frame slow-motion which I don't like as much as the TRV900's smooth (interpolated fields?) 1/3 speed slow motion. Progressive scan mode: I thought the GL1 had a progressive mode, but it actually doesn't. Xiao-qing Wang sent me the following from a Canon rep: The GL-1 does not have a progressive scan CCD chip, instead it features an Interlaced Scan CCD. The Normal Movie Mode captures two fields (odd and even), then interlaces them together for playback. The time delay in scans creates a loss in vertical resolution and decreased sharpness of the still images. In contrast, the Frame Movie Mode captures 3/4 of a frame and interpolates the other 1/4 at the same point. Since both scans are effectively taking place at the same time, vertical resolution is 1.5 times higher. This produces high quality still images, but not quite the level of a camera with a Progressive Scan CCD. Canon USA The GL1 30 fps "frame movie mode" video looks quite good, usually, and to my mind is useful for video in a way that the TRV900's 15 fps prog.scan mode is not. The actual shutter speed is 1/60 (or higher) in this mode, so the camera is in essence recording only half the time, but for many subjects this is ok. Note however that the actual GL1 prog.scan resolution is somewhat disappointing for stills (see above examples). You have to scale them smaller than 640x480 for them to look sharp. Canon's current GL1 brochure calls it "Frame Movie Mode... captures video in a unique non-interlaced method allowing the GL1 to record 30 frames of video per second." The GL1 works fine for editing and batch capture with my DVRaptor. However, when using the GL1 and the Canopus DVRaptor firewire card to do "seamless capture" (video segments longer than 8 minutes, by making multiple 2 GB AVI files) I have a problem. There is a gap of several video frames in the audio at the end of each 2 GB file, so when you play the combined video back you get a break in the audio. It seems like the GL1 audio sampling clock is not quite at the right 48.0 kHz rate. This problem does not happen with the TRV900 so it isn't due to MiniDV "unlocked audio", or the Canopus hardware or software. Apparently other GL1/DVRaptor users report the same problem. section of your canopus.ini file, reboot, and *BAM* it works. xl1 problem. Well good luck. If you already have a MiniDV camera, and are thinking of getting another one, watch out for compatibility issues. My GL1 has audio dropouts (beep noises) when reading tapes recorded on the TRV900. These are infrequent in SP mode, and frequent (with occasional video dropouts as well) in LP mode. Going the other way, the TRV900 has some audio dropouts when reading a GL1 tape in SP mode, especially in the first few seconds of a take, and many dropouts in LP mode. My Sony MiniDV Walkman GV-D900 plays the GL1 tape with intermittent timecode and frequent video dropouts, even in SP mode. I would say, don't depend on exchanging tapes if you need droput-free performance; instead, connect the devices via firewire and make a copy. Batteries: the Canon BP-930 and the Sony NP-F750 are both lithium-ion batteries (each larger than the small battery shipped standard with their respective cameras). The two are identical in size, shape, weight, and energy capacity (7.2 V, 3000 mAh, 21.6 Wh), but they have slightly different electrical contacts and are not interchangable. The GL1 uses more energy than the TRV900 so it has a shorter runtime for the same size battery. Recording energy used is as follows: GL1: 6.7W using the viewfinder, 7.4W using the LCD screen. TRV900: 4.1W viewfinder, 5.2W LCD screen. Viewfinder-use recording time is listed as 2h 15m for GL1/BP-930 and 5h 15m for TRV900/NP-F750. If you're doing the math, you'll realize this doesn't add up. Either Canon is rating the runtime 50% low, or the batteries don't truly produce 21.6 Wh at the current drawn by the GL1. If you do not use a battery pack for a period of more than a few months any remaining charge may cause damage to the battery pack, and reduce usage time. To prevent damage therefore, aim to use a battery pack's complete charge before storage. (GL1 manual, p. 84) The Sony TRV900 manual has no such comment. I don't know if Sony has superior technology or Canon is just more upfront about the limitations. My Sony RM-95 wired LANC remote works fine with the GL1. It will control zoom and focus when used in camera mode. It even enters a service mode in the same way as the TRV900, presenting a complex display on the screen in hex and binary but unlike Sony, Canon apparently doesn't publish its service manuals, so this won't be useful to anyone outside the company. The GL1 is somewhat slower to load and unload tape than the TRV900. I measured GL1: 10 sec unload, 11 sec load. TRV900: 6 sec unload and 9s load. Times from recording video to tape compartment open and the reverse; I did not include extracting or replacing the tape by hand. You have to manually open the GL1 compartment and press the eject button but this is a fraction of a second; the delay is mostly the tape mechanism. Why did you buy the GL1? If you could have only one DV camera, which one? Maybe I'm just a gadget freak. My motivation to buy when I did was, my TRV900 was in for repair (tape crinkle problem) and Sony said it might not be back until January (in fact they were wrong, it was fixed in 6 working days). I wanted a good camera for Christmas and New Years (Year 2000). I had been looking at the advertised features of the GL1 and was interested. Now that I have two good cameras, I figure they will come in useful for something. Writing online MiniDV buyer's guides, if nothing else :-). Which one would I choose, given only one? It is a difficult decision, really. The TRV900 is more useful for stills, due to higher resolution and the memory card feature. But unless you have an excellent TV, you may not notice the lower resolution of the GL1; both are better than the broadcast TV you get over the air (perhaps cable can be better). The GL1 has a better lens (less tendency to flare), longer zoom, more effective image stabilizer, better internal microphone, and more accessible and convenient controls. The GL1 has lower noise and better color in marginal lighting. Under some shooting conditions (good lighting, but lots of low contrast fine detail) the GL1 image has a rather unpleasant "gritty" appearance, which I've never seen from my TRV900 in good light. No doubt you could reduce the sharpness control, but at the expense of image detail of course. The GL1 looks somewhat more impressive and imposing; conversely, it is larger and more conspicuous and the LCD screen isn't as good, and the autofocus is generally slower and in difficult situations (eg. low contrast, moving subject) may not stay locked on. The available GL1 batteries do not run as long as those for TRV900. I prefer the TRV900 in very low light since I can set slow shutter, but in moderately low light, the GL1 at +12dB has better color, and as much overall brightness, as the TRV900 at +18dB (see 50 lux color test). Many people have asked me to recommend the "best" camera. It is my considered opinion that neither one is best, as they both have strengths and weaknesses. The simple answer is it depends on what you do. The higher intrinsic resolution and the flash card feature of the TRV900 makes it my favorite for stills (note, digital still cameras have much better resolution, and 35mm film is still better). If you just want to shoot video, and long zoom and the best possible optical stabilization are important for your work, the GL1 is probably for you. Remember, both cameras are of high quality and you can do excellent work with either one. You can find GL1 opinions from others in the links listed at the bottom of the page. Where is the external mic in connection? Just in front of the tape cassette door on the side of the camera, and behind the lens focus ring, is a plastic cover labelled "DC5V" and "MIC". Open the cover to find a small jack on top providing 5V DC power, and a lower jack with a red plastic rim (sized for a standard 1/8" stereo plug) which is your stereo microphone input. I do not think that Canon advertises the GL1 is capable of recording PAL (they sell a different camera called the XM1 in PAL format). As it turns out, the GL1 cannot display or record PAL format video properly. If you send it PAL video via firewire, it will record "something" on the tape, but it does not play back as clear video. When I tried this, playing a PAL tape from the TRV900 out via firewire to the GL1, I got a blue screen on the GL1 while recording, and video with blocks transposed, like a jigsaw-puzzle, on playback. This tape recorded in the GL1 did not play back properly in the TRV900 either (although the TRV900 could play the original PAL format tape fine). Canon's GL1 webpage has a basic description of the camera. If you have a specific question about or problem with your GL1 contact Canon Technical Support. Dirck Halstead reviews the Canon GL1 for video-journalism in his page here. Adam Wilt compares the GL1 with VX1000 and TRV900 on this page. Alan Levi wrote some comparisons between the GL1 and TRV900 to the "Cassie Tips List", reprinted here. Jim's Photo Page compares GL1 and TRV900 also. 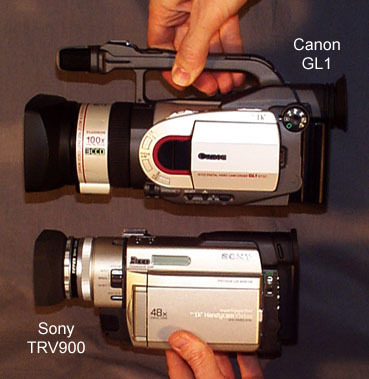 David Ruether reviews many MiniDV cameras including GL1 and TRV900 on his comparison page. There is a user web page about the GL1 including still shots, from Steve Roark here. Nick has some side-by-side shots comparing the GL1 and TRV900. Kevin Shaw has another GL1 page with sample stills. There is a site called gl1-411.com. There is a mailing list for the GL-1 (NTSC) and XM-1 (PAL) cameras. There is a GL1 Users Resource Site including a User Forum. I have collected some notes from many different users here.